Since I haven’t seen the play, I can only speak of the movie – and it is a lovely tale that takes four classic fairy tales and finds a way to weave them into a single story in a single place and time. Into The Woods opens with The Baker (James Corden) and his Wife (Emily Blunt) working in their hovel of a bakery and wishing they could have children. 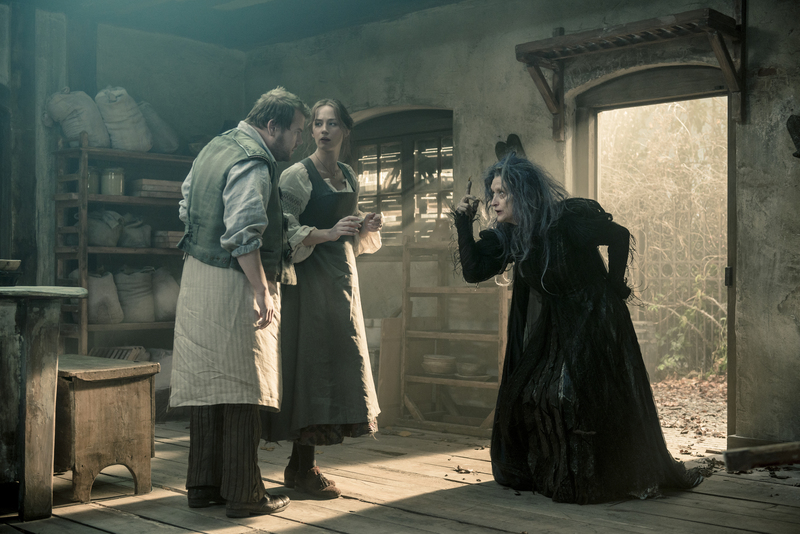 Enter The Witch (Meryl Streep) who informs them they can’t have children because his father stole from her garden and she cursed hi, There is, however, a way to reverse the curse – they must find a cow white as milk, a cape red as blood, a slipper as pure as gold, and hair yellow as corn. To find these things they must go into the woods – and they have three nights to do so. If they have not found the described items by the blue moon three nights hence, they will lose their chance. 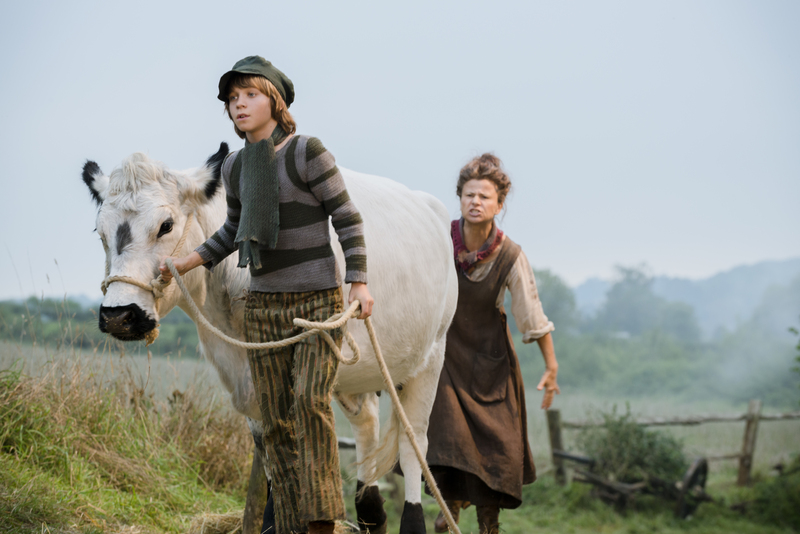 Meanwhile, Jack (Daniel Huttlestone) has been ordered to by his mother (Tracey Ullman) to take their cow, Milky White (!) to market and sell her; Cinderella (Anna Kendrick) wishes to go to the prince’s festival at the castle, though her stepmother (Christine Baranski) and stepsisters (Tammy Blanchard and Lucy Punch) refuse to let her; and Rapunzel (Mackenzie Mauzy) is locked up her tower with no doors by The Witch, who is convinced she’s protecting her when she’s really smothering her. Finally, there’s Red Riding Hood (Lilla Crawford), a larcenous scamp who has helped herself to some of The Baker’s best cookies to take to Grandma’s house in the woods. Most of the story is told in songs, though there is also a fair bit of actual dialogue. The first sixteen minutes are used for one song – the wistful I Wish – as we meet all the players and learn their hearts’ desires. Thanks to a nicely balanced screenplay by Lapine and imaginative direction by Rob Marshall (Chicago, Pirates of the Caribbean: On Stranger Tides), this opening sequence moves us briskly into the story. By its conclusion, we know these people and are quite willing to go along with them on their adventures. When they go into the woods, their paths cross in unexpected ways that lead to equally unexpected resolutions. The first two acts of the movie contrive to bring about the fulfillment of each character’s desires; the last act shows what happens afterward – and it’s not always pretty. 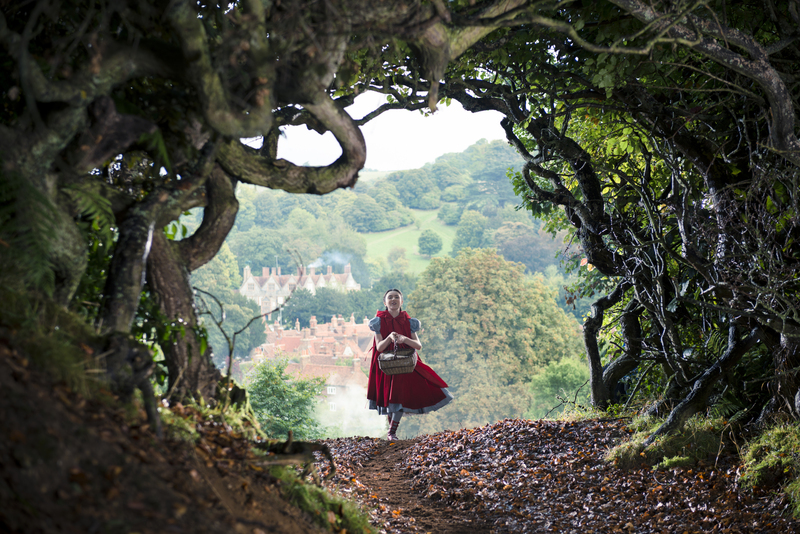 Because Into The Woods has been a musical from its very beginning, it has the kind of ebbs and flows of a musical. The songs are not pretty moments of adornment, they contain crucial plot points and character beats. They are also extremely well crafted. Made for a limited budget (sources have it pegged at around $40-45 million), this is no superhero extravaganza and yet, it is as lush as it needs to be; the practical and CG effects have just the weight they require to make us believe them, and the costumes are so perfectly appropriate that we accept their reality the instant we see them. The cast is terrific vocally with special kudos to Streep, whose range is explored far more than in past efforts Mamma Mia and A Prairie Home companion, and Pine – who shines both in a sequence with The Baker’s Wife and another with Rapunzel’s Prince (Billy Magnussen). Huttlestone and Crawford are also outstanding. Johnny Depp’s appearance as The Big Bad Wolf is a bare minimum bit more than a cameo and his lascivious delivery on Hello Little Girl is also a highlight. Not at all oddly, he makes a very good, zoot-suited (hello, Tex Avery!) wolf. The tagline for Into The Woods is ‘Be careful what you wish for.’ Ironically, Into The Woods is all you could wish for in a holiday movie. Previous PostHeartwarming Trailer: Woman In Gold!Next PostThe Gambler Jams Out!